Department of Ophthalmology, Linköping University Hospital, Linköping, Sweden. situational tutorship, where the teacher adapts to the stages that the trainee passes through with increasing experience. knowledge may affect the training of new cataract surgeons. pedal controls the phacoemulsification machine. 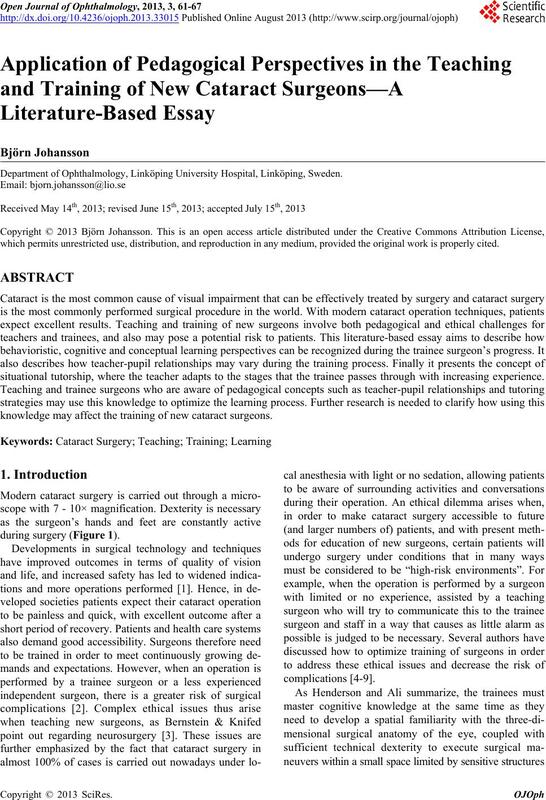 topic “surgical teaching” were excluded. cataract surgery is shown in Table 1.
enrolling less determined or even less suitable candidates. Table 1. Contents of the various stages of a cataract surgeon’s training program. others how to perform the task. critical feedback accurately to a peer. erent phases and situations during the training program. surgeon is involv ed in the selection of new trainees . 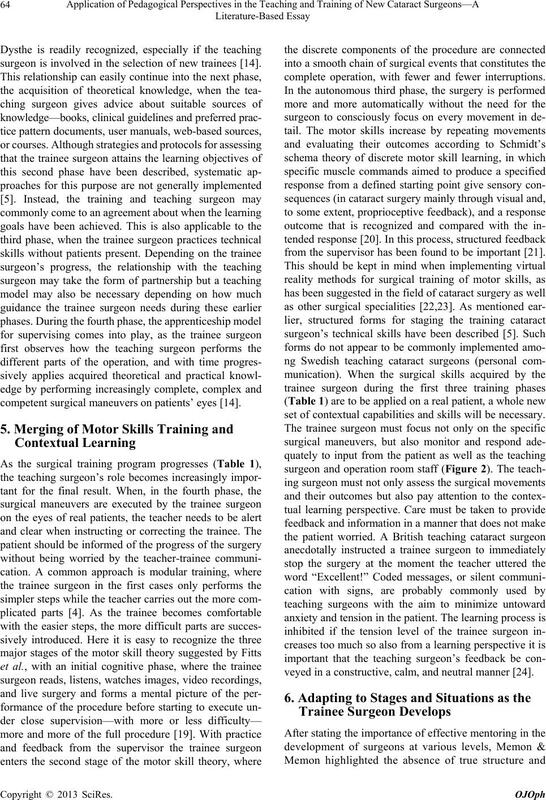 competent surgical maneuvers on patients’ eyes . complete operation, with fewer and fewer interruptions. from the supervisor has been found to be important . set of contextual capabilities and skills will be necessary. veyed in a constructive, calm, and neutral manner . performing the operation with teaching surgeon present. room upon request or stay during the whole procedure. 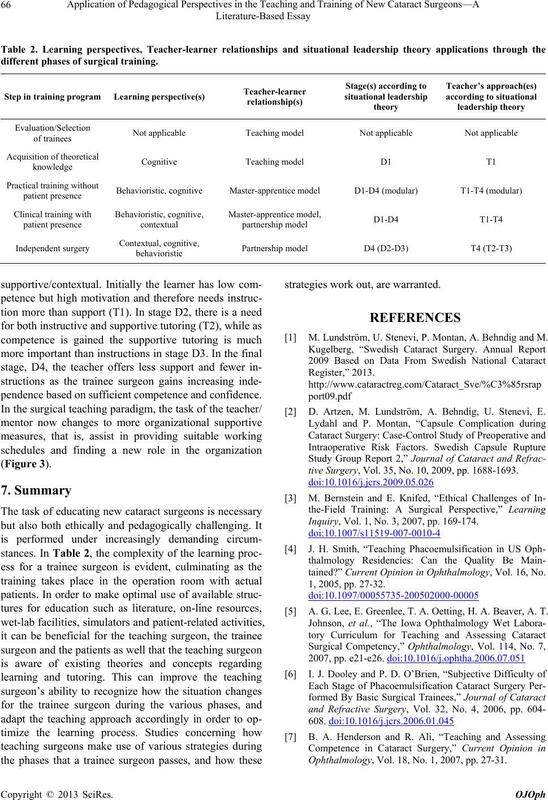 incentives for mentorship in training of surgeons . learner who is reluctant to take on more advanced tasks. different phases of surgical training. pendence based on sufficie nt com petence a nd c onfi dence. strategies work out, are warranted. M. Lundström, U. Stenevi, P. Montan, A. Behndig and M.
 D. Artzen, M. Lundström, A. Behndig, U. Stenevi, E.
tive Surgery, Vol. 35, No. 10, 2009, pp. 1688-1693. Inquiry, Vol. 1, No. 3, 2007, pp. 169-174.
tained?” Current Opinion in Ophthalmology, Vol. 16, No. A. G. Lee, E. Greenlee, T. A. Oetting, H. A. Beaver, A. T.
Ophthalmology, Vol. 18, No. 1, 2007, pp. 27-31.
tions,” Canadian Journal of Ophthalmology, Vol. 44, No. E. S. Niemiec, K. L. Anderson, I. U. Scott and P. B.
Vol. 116, No. 4, 2009, pp. 678-684. Health Professions, Vol. 30, No. 1, 2010, pp. 51-56. 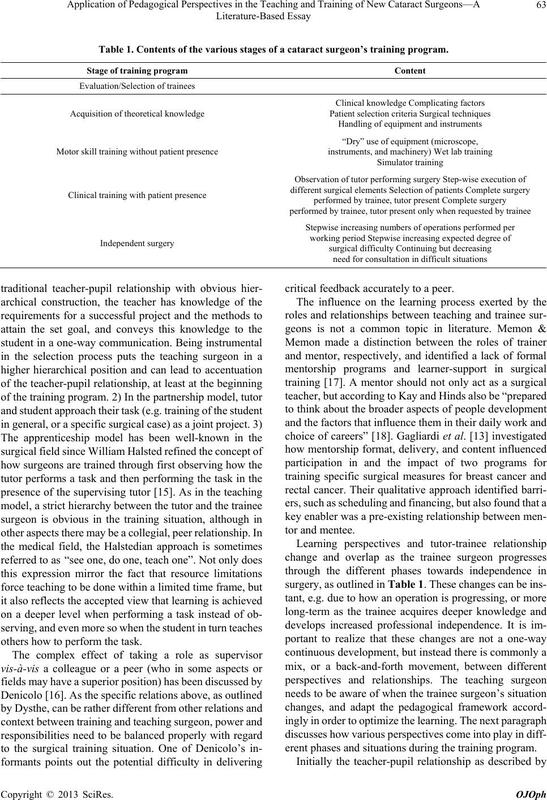 Heritage,” Annals of Surgery, Vol. 225, No. 5, 1997, pp. 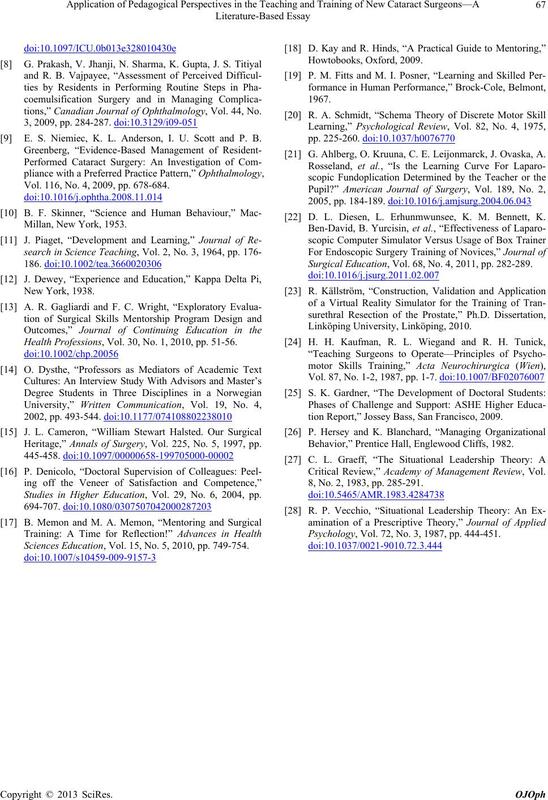 Studies in Higher Education, Vol. 29, No. 6, 2004, pp. Sciences Education, Vol. 15, No. 5, 2010, pp. 749-754. G. Ahlberg, O. Kruuna, C. E. Leijonmarck, J. Ovaska, A.
 D. L. Diesen, L. Erhunmwunsee, K. M. Bennett, K.
Surgical Education, Vol. 68, No. 4, 2011, pp. 282-289.
tion Report,” Jossey Bass, San Francisco, 2009. Behavior,” Prentice Hall, Englewood Cliffs, 1982. Critical Review,” Academy of Management Review, Vol. 8, No. 2, 1983, pp. 285-291. Psychology, Vol. 72, No. 3, 1987, pp. 444-451.